Look for the ReciteMe icon. Then look for the link for the newsletter you want to listen to. Allow time for Reciteme to process the text into speech. 4. When the magazine is available, you should see the newsletter with all the pages listed at left. 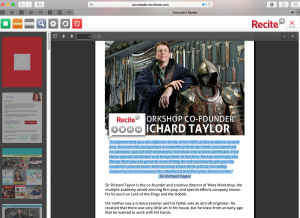 When you scroll to the page you want to read and hover over the text, Reciteme will begin reading aloud. You can change the voice of the speaker if you prefer. 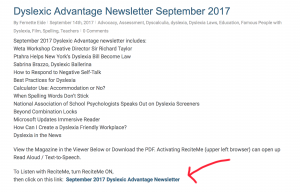 Back issues of newsletters can be found HERE.